Book(s) now for the Lotus Festival! Back in 1998, when Brands Hatch staged the Lotus 50th Anniversary Weekend, an aspiring young publisher made his way down to Kent clutching a handful of fliers for his imminent new book, fretting a little because the actual book was not ready in time. He need not have worried however as ‘The Lotus Book’, as it was simply titled, was a huge success, detailing every single Lotus Type produced to date. In time-honoured Lotus fashion it was updated into S2 and S3 editions. 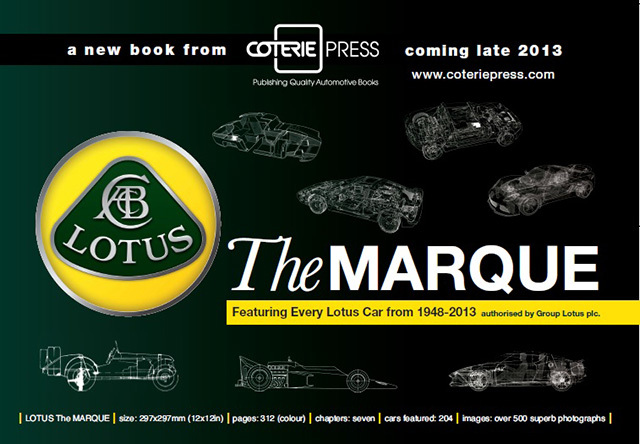 That book paved the way for William Taylor to form Coterie Press and go on to publish other definitive Lotus works such as Dennis Ortenburger’s ‘Lotus Elite’, Michael Oliver’s brilliant work on the Lotus 72 and Jeremy Walton’s books on both the Esprit and Elise. There are driver biographies too, such as Lotus authority Johnny Tipler’s tribute to Ayrton Senna during his Lotus years and Lorie Coffey’s intimate look at the life of Elio De Angelis. William has subsequently moved home from London to Colorado in the USA, but he could not pass-up the opportunity to once again attend a Lotus Festival at Brands Hatch, clutching a bunch of fliers for a book that’s not quite ready – it really is the successor to that much-loved original ‘The Lotus Book’. 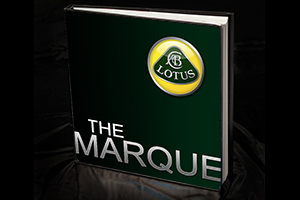 His new book ‘Lotus The Marque’ will assuredly be well worth the wait. You’ll find Coterie Press in the trade area where William will have his full range of books on sale – when he’s not checking-out the vast array of Cortina’s that is, as he’s recently become a Mk2 Cortina-Lotus owner!